Thanks for your concern, so sweet of you! But I am feeling okay again, and can enjoy the summer here. Jan did some additional painting in the garden, he did the shelves on which we have standing a lot of pots and also the "nursery"shelves. It is looking so much better now, in a fresh green. I didn'take any photos yet, may be this weekend I can take a good shot of it. Yesterday I was feeling so much better already but took a bit of low profile the whole day, although I got some work done. I did all the ironing that was waiting for me. Even had fun doing it( not my fabourite job LOL), I opened the windows to the garden, so could see/hear Jan painting there and I put on a nice cd with some great music (this time of "Yanni", instrumental music), turned the volume higher than normal and this way both Jan and I could hear the music. See me, at the ironing board, kind of wiggling at the rythm of the music??? Wonderful!!!! Weather here is great, it might be that tomorrow there is a little "dip"in it but then again from Sunday on it will be real summer, with even really high temperatures. This week there is the event of the "4 days of Nijmegen", a walking happening that is held every year again. The participants are having great weather, even sometimes too hot for walking a lot of kilometers. I will give you a link to take a look at it and know what it's all about. Today is the last day and the arrival in Nijmegen always is like a big party, very special! There also is the Tour de France, cycling, to watch, today again they will have a very, very, difficult day with lots of extra high and harsh mountains to climb! Every guy, cycling there and completing the 3 weeks of hard work, has to be admired! I want to go out shopping a bit earlier today, when it isn;t too warm yet, and for the rest of the day I don't have any real schedule LOL. There is of course some cleaning to do, meaning the woodwork getting ready for painting, not sure yet if I will do it today. Also could take a short trip to the market, some fruit would be welcome, as well as some veggies. Some other smaller chores could be done, so lots to choose of, no idea what will be excecuted ROFL. I have a pastel colored freebie for you, bit vintage like, you even get a stacked paper in it, so nice of me hahahaha! 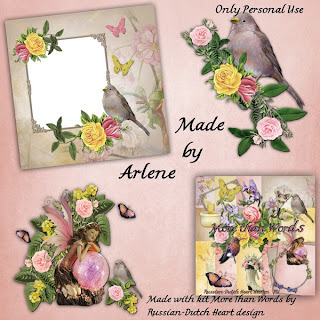 And look at the quickpage Arlene made with it for you! 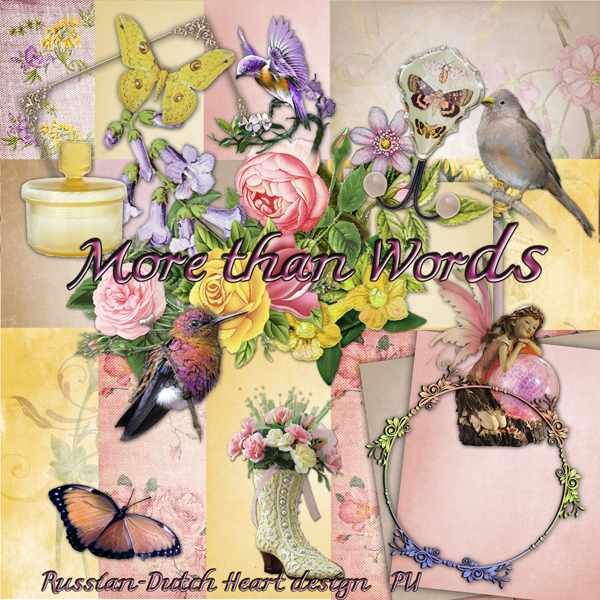 Kit is named"More Than Words", in 2 downloads. Wishing all a fantastic weekend! Wow!! 3 wonderful and nostalgic kits this week, and a beautiful stacked paper ! Thank you so much...!! Arlene did fantastic QP and clusters too, thank you!! Thanks again for sharing all your great work ! Dank je well. I always love your romantic papers. Wishing you and your Jan a wonderful Weekend. 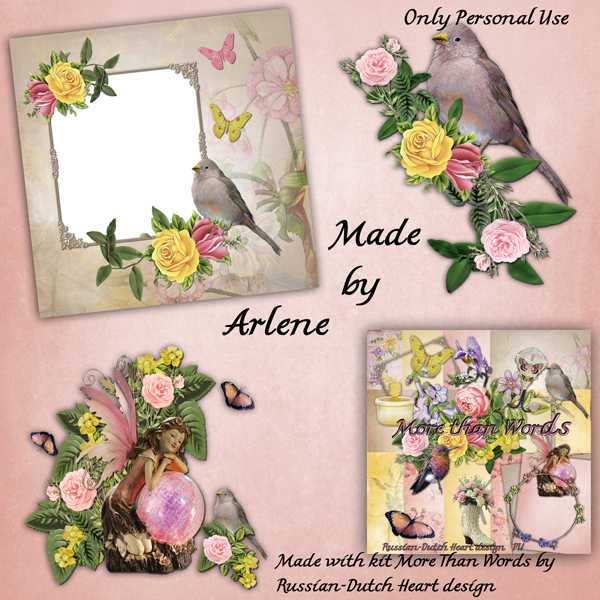 Hello and Thank you Kyra and Arlene for these lovely downloads. You both do such beautiful work. I have caught up on some of your posts that I missed. :) You HAVE been quite busy. :)I bet things are looking soo nice now! Hope you have a FANTASTIC weekend my friend!! Thank you so much for the beautiful downloads! Love your work! So glad you are better. These are beautiful - thank you both! What a beautiful kit! And Arlene's clusters are just wonderful. I have to get busy here and start making more QP's. I've been so lazy this year. I'm so glad that you are feeling much better now. Just don't rush back into a busy schedule. Take care of you first. Your health is more important than household chores. Have fun at the market. Fresh fruits and veggies sounds delicious. Enjoy your day, hugs, Edna B.